You are here: Home / Archive Contents / Should the Preacher Expose Error From the Pulpit? Should the Preacher Expose Error From the Pulpit? How many times has this happened to you? You get a letter  usually not signed  which is a scathing denunciation for the sermon preached last Sunday. You read how offensive your remarks were and how upset this per-son became over your insensitive comments. What on earth did you say that was so offensive? Did you use suggestive slang? Or were you overly graphic in a description of some horrible event? Or did you lose your temper and say things you should not have said? What on earth could you have said that up-set the listener? All you did was expose compromise or reveal heresy or deny false doctrine, and for that you were condemned and probably lost a family from your church! In this world of political correctness and tiptoeing around, we are seeing more and more of this kind of thing taking place. "Oh, I can't believe what he said about the pope!" "I just don't think you ought to criticize other religions." Most fundamental, Bible-believing, gospel-preaching, Hellfire-and-brimstone preachers have heard this kind of comment about their "insensitivity" and "intolerance." In defense of all the narrow-minded bigots who unceasingly anger their congregations, let me reason with you for a moment. How many ways are there to heaven? 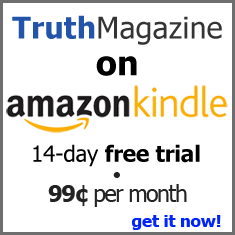 How many "truths" are there in the world? The Bible teaches that there is only one way to Heaven. The same Bible teaches there is only one Truth. In John 14:6 Jesus said, "I am the way, the truth, and the life: no man cometh unto the Father, but by me." Jesus did not say he was a way, as if to say one among many, but he is the one and only way to Heaven. He is not a truth among many truths; He is the one and only Truth. With that truth from the word of God, then when a Roman Catholic teaches that a man is saved by keeping the seven sacraments and that the church is his source of redemption, I, a man of God, have a responsibility to denounce that and preach the Truth. The Bible says in Ephesians 5:11,"And have no fellowship with the unfruitful works of darkness, but rather reprove them." The Greek word for "reprove" means "to expose." When folks come to my church and are convinced about some false teaching, I am acting in a biblical manner if I preach the truth to them. And it grieves me when a member of my church gets upset at me for doing what the Bible says I am to do. "But who are we to judge?" they piously say. When you reprove, the word of God is doing the judging. The truth is exposing error. Ultimately, this issue boils down to one simple question: What is your final authority? The Word of God is the final authority for faith and practice. In other words everything I believe and everything I preach has to have a scriptural foundation. Now, with all that is going on in the religious world today, I must have something upon which to gauge whether a matter is right or wrong. I have found that the best way to see if a stick is crooked is to lay a straight stick beside it. And as I lay the straight stick of the word of God down beside one of these things that go on and which impact the understanding of my people, I have a responsibility to cry out and let them know that the other stick is crooked. Granted, this will make some angry, but it is also going to stop some of the wrong ideas and false doctrines floating around. One of the areas where churches are misguided is the charismatic movement. Again, what is the final authority? Is it the Word of God? Or is it some revelation that Sister so-and-so claims to have received? The Bible says in 1 Corinthians 13:8, "Whether there be prophecies, they shall fail; whether there be tongues, they shall cease; whether there be knowledge, it shall vanish away." When is this going to happen? Again the Bible says it will be when that which is perfect is come (1 Cor. 13:10).God has given us only three perfect gifts. Three is the number of completion in the Bible. The three perfect gifts God has given are: first, his son, Jesus Christ; second the Holy Spirit; third, the word of God. Now when this epistle was written, the word of God was not yet complete. Much of the New Testament was yet to be written. The other two gifts had al-ready been given. The first-century church "knew in part and prophesied in part" (v. 9) because the word was not yet completely given. It was there-fore necessary for God to give them these sign gifts, like tongues, prophecy and words of knowledge. But at the end of the first century, with the penning of the book of the Revelation, the word of God was complete. Everything we need to know about God, Jesus, the Holy Spirit, salvation, faith, the future, Heaven, Hell, angels, demons, life and death, is revealed in the word of God. God no longer speaks the way he did in the first century be-fore the word was finished. So when people say God gave them a revelation and told them something, or when they say they got a "word of knowledge" that someone in the room was being healed of some disease, I lay the straight stick down beside that, and it doesn't take long to see that the stick they are using is crooked. Again, what is the final authority? Is it what is perceived as right by society? In other words, what is political correctness? Is it what Aunt Susie says she saw? Is it what Dr. Know-More-Than-God received in a vision? Or is the final authority the complete, holy, inspired word of God? As a man of God who has some people who may be persuaded by this false doctrine and accept it, I have a responsibility to declare the truth and expose error. In the book of Acts, we read that the Apostle Paul, Barnabas, Silas, James, and several others were jailed, beaten, stoned, scourged, and hated. Do you know why? Because they believed that there is only one way to go to heaven. So that is the gospel they preached. No compromise, no backing down, no apologies; they preached the one truth and let the chips fly where they would! And that gospel was totally contrary to the accepted teaching of the day. Judaism prevailed, and that was a "works" religion. The disciples made people mad because they would not bend. They preached the gospel and exposed the false doctrine. Are we to bend simply because, our society accepts any attempt to get to Heaven? Are we not to reprove false doctrine because our nation thinks everything religious in nature is "just wonderful"? Do we drop our convictions and compromise the word of God for the sake of political correctness? I certainly hope not. I hope you take a strong stand against error and for the cause of the one true gospel of Jesus Christ. Now don't get me wrong. I don't think we ought to spend every service blasting false doctrine. But if we are to preach the whole counsel of God, we will invariably have to reprove some false doctrine. So what is to be done when one gets a poison letter filled with anger and hurt. First, it will not help to get angry and say something in retaliation. Second, love and pray for the writer or writers. Even if they leave the church, pray for them and love them still. It has been my experience that most will eventually come back. When they get hungry, they will come back where the food is being served. Third, keep a good balance and keep teaching and preaching the one true message of God's word. Rest assured that if you preach the word you will be offensive to some. We never want to hurt nor offend any-one. But in this age of confusion and chaos, the truth of God's word is going to offend. However, don't let that stop you from preaching the word of God. Preach it in the right spirit and with clarity, with power and with a burden. God will bless it. Don't forget that Jesus "came unto his own, and his own received him not." But thank God, "As many as received him, to them gave he power to become the sons of God." Not all will receive you and your message, but more will than won't, and they will love you for teaching them the truth.